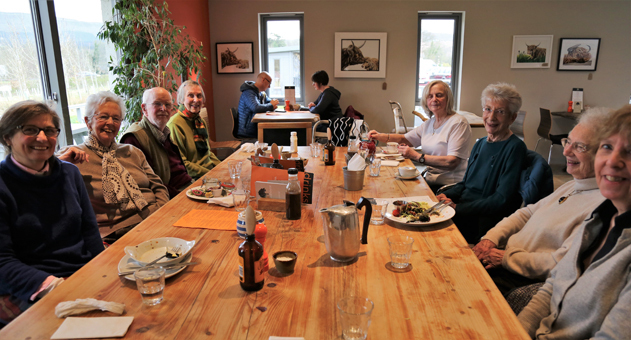 On Thursday 28 March, the Fellowship departed for lunch at the Woodhouse Coffee Shop, Kippen (actually closer to the site of the former Kippen Station) after Morning Prayer and a short Lent Study discussion. The “café”was more of a modern restaurant (from March 2012) and had attached a veritable Aladdin’s cave containing a gift shop with local crafts and a gourmet food hall, not to mention an extensive selection of gins. An interesting feature beside the group’s table was the location of an indoor beehive. Sadly, the bees had died out over the winter, but a new hive will be installed soon. Our food was served promptly, considering the restaurant was very busy – we did wonder where all these people had come from and why they weren’t at work! Everyone seemed happy with the range of dishes provided, especially the cheese soufflé. 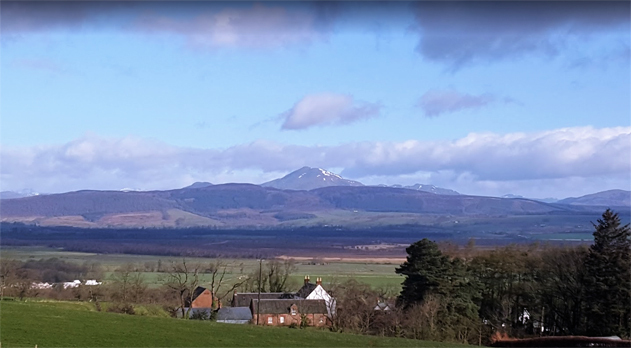 However, it was soon time to return to Milngavie: the sun came out, the Campsies sparkled in the afternoon light and the Crow Road beckoned, completing a feel-good outing perfectly.